December 19 Group: Never Again. 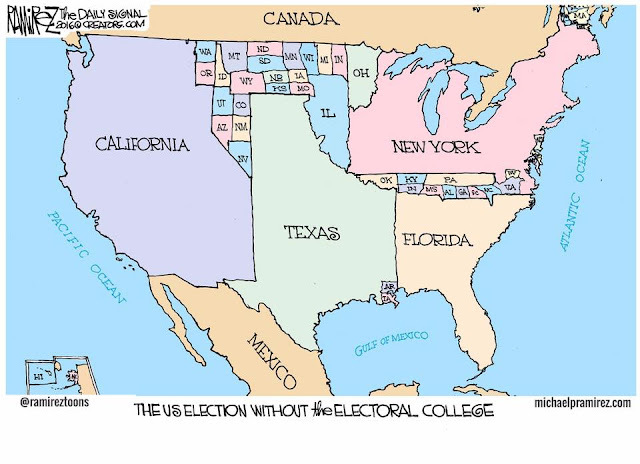 Caption: "The 2016 election without the electoral college." ENCOURAGE YOUR STATE ELECTORS TO VOTE THEIR CONSCIENCE. PLEASE CARE ENOUGH TO SHARE WITH YOUR INTERNET CONTACTS! Repurposing this site. Watch for new. For now, Dec 19! 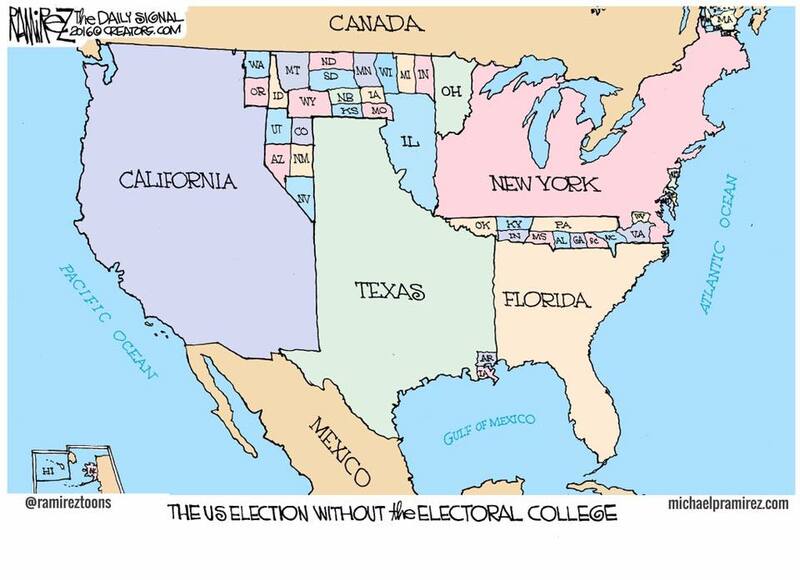 Why would anyone living in a small state submit to the loss of electoral college? Electorial College Yes or No? 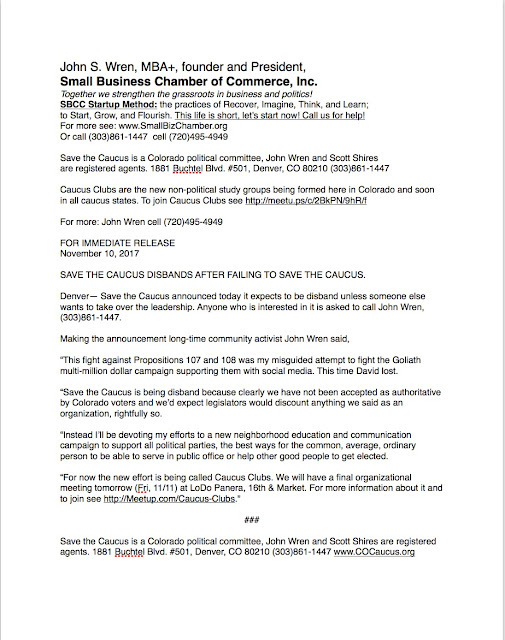 Release: Save the Caucus Disbands. Watch for media release to be posted here at 10 a.m.
Don’t forget to vote! And vote NO on 107 and 108, they will kill the Colorado Grassroots. will thank you and so will I if you’ll let me know what you have done. by return email would be very much appreciated. the little we can and trust that with God’s help it will be enough! Together we strengthen the grassroots in business and politics! to Start, Grow, and Flourish. This life is short, let’s start now! Call us for help! Early voting results, how you can help today. In Colorado as of yesterday, November 3, 1.4 million ballots in, click for full report. This is just about your last chance to use social media and email to ask your Internet friends and family to vote NO on 107 and 108. DO IT! DO IT NOW! Just share one of the posts below or create your own. This afternoon (Fri, 1/4) at 4 p.m. the Caucus Club steering committee click for more will meet for the last time, at 4:30 p.m. in the same location our Small Business Chamber of Commerce, Inc's LoDo Denver IDEA Cafe Startup Workshop click for more will meet, and at 6 p.m. Socrates Cafe. PLEASE forward this along to anyone you know who might be interested. Thanks! This life is very short, let's get started! Our wonderful grassroots system has served us well since 1912. That we Coloradans might be duped by newcomers and outsiders into trading our grassroots for AstroTurf is very sad. But that is just what will happen if the forces seeking to, “Kill the Caucus”, use their great wealth and power to lure us into the Borg-like Presidential Primary system with their toxic Propositions 107 and 108. “We're systematically replacing ‘social capital’ with plain old monetary capital (with primaries),” wrote Sue O'Brien in 2002. “Colorado's traditional caucus-convention system, in contrast, rewards the shoe-leather and diligence. It provides a low-cost way for aspirants to work the neighborhoods, investing energy instead of dollars.” See complete article in post here on COCaucus.org. For more click here: Colorado Caucus News , or call John Wren at (303)861-1447. This wonderful grassroots system has served us well since 1912. That Coloradans might be duped into replace our grassroots with the astroturf is very sad. But that is just what will happen if the powerful forces seeking to, “Kill the Caucus”, use their great wealth and power to lure us instead into the Borg-like Presidential Primary system with their toxic Propositions 107 and 108. For more see Colorado Caucus News or call John Wren at (303)861-1447. Let Colorado Vote: "Lies, lies, and more lies, says John Wren"
Multimillion Dollar Campaign to Kill Caucus. Denver— John Wren, registered agent for Save the Caucus, a Colorado political committee, said today the group has responded the new advertisement for Propositions 107 and 108. “Propaganda is being used by powerful forces in an attempt to grab even more power,” said Wren. “We’ve responded with this web post we hope those who agree with us will pass along to their friends. “This is a real David and Goliath battle. If our side of the story doesn’t get out, it is very likely 107 and 108 will pass, much to our detriment. "'Claim: Colorado Caucus unfair to average, ordinary citizen. "'Truth: The Colorado Caucus is the best way for the average, ordinary citizen to serve in elected public office. Without the Colorado Caucus, it is difficult for anyone to get elected to a local political office to represent their neighbors. "'Powerful forces, backed by millions of dollars is trying to create chaos in Colorado politics. Why? It will kill the grassroots and make voters easier to manipulate with misleading ads like this one. "'Vote NO on 107 and 108! But that’s not enough, go to our website and share.'"